The NSW Department of Planning’s draft Development Control Plan for Gosford reveals the State Government’s intention to develop the city’s waterfront. Central Coast Coordinator General, Lee Shearer, has said that the proposed revitalisation of Gosford would “not touch the waterfront”. The three place-based reports produced by the NSW Government Architect did not include the waterfront, and nor did the State Environmental Planning Policy (SEPP), but the draft Development Control Plan includes reference to commercial buildings on the waterfront with floor plates of up to 2,200 square metres. Proposed controls covering the waterfront can be found in Appendix C of the draft DCP, which is currently on public exhibition until September 20. The draft DCP says it “adopts by reference, the provisions of Part 4.4 Gosford Waterfront from the Gosford Development Control Plan 2013”. However, Appendix C of the draft DCP contains an amended version of the 2013 plan and includes some surprises that the community and Central Coast Council have not been consulted on. “Where changes to the existing controls have been made, these are either minor changes, obsolete provisions, or because they are inconsistent with the recommendations of the NSW Government Architect in the Urban Design Implementation Framework (UDIF), or the intent of the Gosford City Centre SEPP, or the Chapters of this DCP,” the draft DCP explains. Land uses along the waterfront will include residential, commercial office, retail, visitor accommodation, recreational and cultural uses, the draft says. The Gosford Breakwater, adjacent to Poppy Park, is a key location in the NSW Government’s plans. 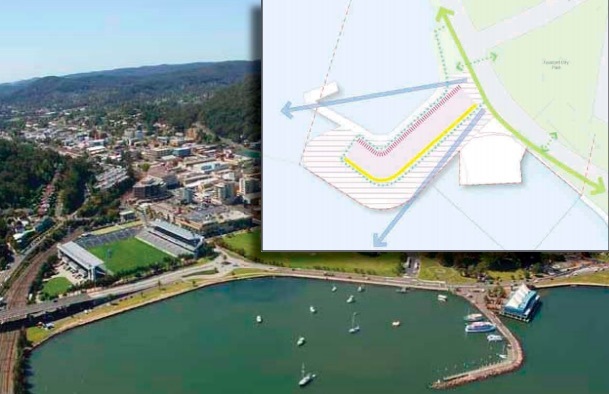 “The Breakwater will provide opportunities for a commercial office, restaurant and retail precinct on the Gosford Waterfront, provided by an extension of the foreshore to provide new developable land.” The Breakwater will be reconfigured “to facilitate a development parcel that can accommodate commercial development, a small retail and restaurant strip and new public landscaped areas. “The reconfiguration of the Breakwater is to minimise environmental impacts and any fill material should be sourced from material validated suitable for the purpose. “The reconfiguration of the Breakwater should also minimise disturbance of the adjacent seabed. “There will be a new access road off the Central Coast Highway generally along the alignment of the existing Breakwater.” The draft DCP includes figures outlining requirements for “building envelopes and development of the foreshore”. “Any development application that proposes to vary the location of the building envelopes is to demonstrate an improved urban design outcome and maintain key public spaces,” it says. “Key public spaces and public plazas are to be provided,” in accordance with another included diagram. A new civic space will be created and a pedestrian connection to replace Vaughan Ave between Mann and Baker St.
A major pedestrian crossing of the Central Coast Highway (Dane Dve) is to be provided in the vicinity of Baker St and a public plaza. “Any new development along the Brisbane Water foreshore should maintain continuous public access to the foreshore,” the draft DCP proclaims. Detail of public access and connections to public access are to be provided at development application stage. The maximum floor plate size for commercial buildings will be 2,200 square metres, which is greater than the 1,500 square metres provided for in other parts of the CBD. “The foreshore edge will be activated and celebrated with upgraded open space and key public spaces, pedestrian walk ways and cycle ways. “New and existing marina and boating facilities will be provided to attract both waterborne tourists and boat owners. “Attractive pedestrian and cycle routes will link into the regional Point Clare cycleway, along the edge of the railway causeway,” it said. There will be a “multi use car park to serve the commercial development and recreational activities,” but the exact location is not given. According to the draft DCP, the NSW Government will “investigate opportunities to provide a new public ferry wharf on the Gosford Breakwater”. Baker St is to be extended and formalised as a key pedestrian and vehicular connection. The development of the Leagues Club fi eld, according to the draft plan, should provide a variety of publicly accessible outdoor recreational spaces, new pedestrian and cycle links… and include a new indoor recreational facility. Independent planning consultant, Gary Chestnut, said the SEPP and draft DCP include what appears to be a developable parcel (with its own Lot and DP) over the water between the existing Gosford Breakwater and the railway line. “It extends across the water, but the DCP and SEPP are silent about it, so the NSW Government could prepare a master plan and promote whatever they want on it,” Chestnut said. “The current development controls for the waterfront were drafted when building heights and floor space ratio were restricted. “Now if you have a site of 5,200 square metres, you could have a new five star hotel built over the water with no height limit. “The thing is, the DCP should be amended so that unlimited floor space ratios and building heights are excluded from the waterfront,” he said. Source: Website, Sep 10-11 Gosford City Centre draft DCP, interview, Sep 11 Gary Chestnut, Gosford CBD Community Alliance, Jackie Pearson, journalist.